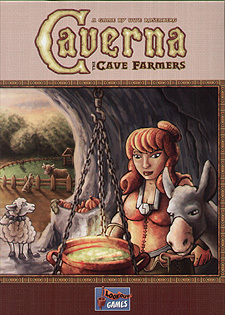 In this game, you are the bearded leader of a small dwarf family which lives in a little cave in the mountains. Together, you cultivate the forest in front of your cave and dig deeper into the mountain. You furnish the caves as dwellings for your offspring as well as working spaces for small enterprises. It's up to you how much ore you want to mine. You will need it to forge weapons that allow you to go on expeditions to gain bonus items and actions. While digging through the mountain, you may come across water sources and find ore and ruby mines that help you increase your wealth. Right in front of your cave, you can increase your wealth even further with agriculture: you can cut down the forest to sow fields and fence in pastures to hold your animals. In the end, the player with the most efficiently developed home board will win the game.